Genre: War, Action, Adventure, Adaptation, Sci-fi fantasy. In an action-adventure movie that unfolds across the seas, in the skies and over land, Battleship is a flick depicting a war where the planet earth fights for survival against a superior force. Based on Hasbro’s classic naval combat game the story line centers around war games in Hawaii pitting various naval forces from around the world against one another. But in the midst of the “games” it all turns very real as the fleet of ships gathered for the games are forced to do battle with an armada of unknown origins in order to discover and thwart their destructive plan. Apparently Hasbro believes the way back to the top of the “game” scene is through the use of “games” turned into big screen movies. From the people who gave us the Transformers franchise, Hasbro tries their hand at the big screen again bringing the classic Battleship game to life on the big screen. First off lets say this movie is “loosely” based on the Battleship game. Before it’s release many people were pounding on Universal Studios for producing a movie based on a game. But when all is said and done, this movie has more connectors with Transformers than it does with the Battleship game. With the exception of one scene where the movie has a somewhat Battleship game feel, it’s more of a twist on Transformers where the mechanical creatures are controlled by aliens outfitted in body armor. Clocking in at better than two hours I had my apprehensions about this movie. The trailers made it look like nothing more than a different twist on the Transformers and those movies I found over-rated and under-acted. While there are similarities between Battleship and Transformers – in my opinion – Battleship outshines the Transformers franchise when it comes to quality and especially acting talent. The most notable difference revolves around the acting talent. While Liam Neeson’s part as Admiral Shane is somewhat small, he certainly raises the bar when it comes to actors and pulling a better performance out of those around him. While Rihanna, Taylor Kitsch and model Brooklyn Decker grabbed credits in Battleship, Jesse Plemons who plays Boatswain Mate Seaman Jimmy ‘Ordy’ Ord should receive a standing ovation for his performance. This young star most notably known for the TV series Friday Night Lights is outstanding. His unassuming manner when it comes to acting style actually moves him to the forefront of every scene he’s in. Here’s hoping we see much more of Plemons in the days ahead as he has the making of a star all over him. If you’re looking for action, you will find lots of it in this movie. If you like a different twist on the alien theme, you will find that in this movie. If you’re looking for a turn-your-mind-off-movie where you say “they could never do that”, you will enjoy Battleship. The bottom line is this – Battleship is a great movie if you’re just looking to escape what’s going on around you for a couple hours. 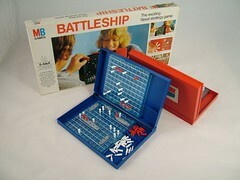 As for the rating – Battleship is not family-friendly. Once again we need to see a new rating for a 16 and above crowd. There’s simply too much violence here for an audience younger than 16. However I will say this – I was pleasantly surprised at the “lack” of foul-language in this movie. There are two assumed “f-bombs” tossed in but even those are quickly covered over. Overall, I enjoyed Battleship more than I thought I would. Even though it’s longer than 2 hours, the time passed by quickly. This might even fall into the category of “adding to my collection” when the DVD comes out.